What are Subwoofers and Why Do We Need Them? What Kinds of Subwoofers Exist? How Can Subwoofers Improve Sound Quality? Would you like to improve the sound quality of your stereo system at your home, car or office and add more bass to it? One small subwoofer could make a great difference and that’s why we’ve prepared this article on 16 best 8-inch subwoofers on the market. If you need a small subwoofer, we have a lot to offer. Our list contains 16 models that belong to different price ranges and have different characteristics. That’s why we are sure that each and every one of you will be able to find the perfect subwoofer for himself. And not only that. We have prepared a small introduction in order to explain to you the main purpose of subwoofers and show you how they work, what their good and bad sides are and what tricks you can use to get the best possible subwoofer that fits your budget and your needs. Besides the previously mentioned 8-inch subwoofers, there are subwoofers in many different shapes and sizes. For example, you have 10-inch, 12-inch, 15-inch subwoofers but we are going to talk about those larger subwoofers in our next article. This time, we are concentrating on the smallest, 8-inch subwoofers. The first subwoofer was produced in the 60s and since then, the subwoofers have been improved a lot. Today, we can’t imagine listening to music through some speaker system that doesn’t have a subwoofer. A subwoofer is actually one or more woofers placed into one large loudspeaker enclosure. The enclosure is usually made of wood (more expensive version) or plastic (cheaper version). The materials they are made of should be resistant to deformation caused by the great air pressure. Subwoofers produce only low frequencies that are commonly known as bass frequencies (or just bass). There can be one or more subwoofers in one speaker system, but one is usually enough to reach the satisfying audio quality and achieve a certain type of sound. The first number represents the number of speakers while the number after the period defines the number of subwoofers (for example, in 2.1 stereo speaker system, 2 refers to the number of speakers and 1 to the number of subwoofers). The subwoofers produce low-frequency sound. Most of them have a frequency response from 20-200 Hz. Professional subwoofers have frequency response lower than 100Hz, while the high-fidelity subwoofers have frequency response lower than 80Hz. Having good lows is very important, as the general impression is not the same with and without good bass. However, you should be careful with them as they can be both useful and dangerous (they can destroy the sound quality by overpowering all the other speakers). If you set everything up appropriately, you will get great sound with rich punchy and powerful bass, excellent mids and clear highs. They will all be distinctive and your music with a lot of bass will show all its beauty while the special scenes in movies (thunderstorms, car engines, explosions, etc.) will sound amazing and realistic. The two main categories of subwoofers are passive and active (powered) subwoofers. The quality of sound doesn’t really depend on the type of subwoofer. It depends more on the quality of a subwoofer (quality of the enclosure and quality of drivers) and on the way you connect it to the rest of the speaker system. Here we have the basic characteristics of both types as well as their main differences. Passive subwoofers are called passive because some receiver or an external amplifier supplies them with power. When you have this kind of subwoofer, it means that you have all your speakers, the subwoofer as well as your TV or some other device connected to one receiver or amplifier. That receiver/amplifier supplies the subwoofer with power and that can cause you serious problems if you don’t have the right receiver/amp with the necessary wattage. These subwoofers are usually lighter and cheaper, but you have to be cautious as the receivers/amps are usually bought separately and they can sometimes be more expensive than your entire home theater speaker system. The powered subwoofer is called active or powered because it is supplied with power directly from the wall socket. It has a built-in amplifier so you don’t really have to worry about any receivers or external amps that you have to buy separately. If you have powered subwoofer, you just power it on and connect to the speakers or to your receiver and that’s all – it is ready to play. However, the built-in amplifier makes it more expensive and heavier. There are some placement limitations since the subwoofer has to be close to a wall socket and to your receiver. You can also buy a wireless powered subwoofer. It is the new trend and it makes your life easier – you just have to plug in the subwoofer, turn it on, and it will wirelessly connect to other speakers (or to the main unit in your home theater speaker system). We are sure you are wondering if subwoofers are really that important as some say and how they can improve the sound quality of your speaker system at your home, office or car. It may sound strange, but they can. They are not the only responsible as many things depend on the room itself and the acoustic properties of your house/room are also important as well as the position of the speakers and the subwoofer. However, if everything is set properly, subwoofers can really improve the sound quality. Good subwoofers can completely change the sound coming from your speakers because they are not there only to deliver low-frequency tones. They are also there to help the mids reach perfect clarity. Subwoofers are there to reproduce tones lower than 50Hz because regular speakers can’t really go that low. That way, you will hear every detail and every tone of your favorite songs, even the lowest ones. They also allow you to turn up the volume to the max without worrying about the distortion and enjoy your music completely. They should reproduce the low-end realistically and help other speakers in the system to show their full potential. Due to all these reasons, you can be assured that subwoofers are incredibly important (even crucial) part of any speaker system and they can help you a lot. Of course, everything should be arranged perfectly and that’s not an easy mission, but we have prepared some piece of advice to help you find the best subwoofer for your needs and you can find them at the end of this article. MTX RT8PT, commonly known as Road Thunder, is one of those relatively expensive subwoofers on the market and one of the most expensive ones on our list. It is quite small (21.3×9.8×9.8 inches) and it weighs 19 Ib. The subwoofer has one 8-inch driver and a built-in amplifier with an output power of 120 W. It comes in grey color only, it has vented enclosure and its frequency response spans from 35 Hz to 250 Hz. The subwoofer comes in a simple cardboard box with a user manual, external bass control, external bass control cable, Allen wrench, mounting straps as well as all the necessary screws and washers. 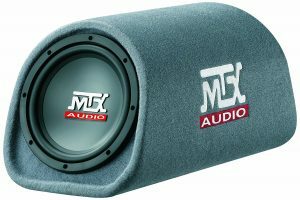 MTX Road thunder is one of the smallest subwoofers on the market, which makes it easy to fit small rooms and cars. It has a cylindrical shape and it is covered with aviation grade carpet in a kind of neutral color that enables you to combine the subwoofer with any interior. On the front side, you will see the speaker. The woofer cone is made of polypropylene and there is some kind of rubber material around the speaker. On the sides, you can see the company logo, while the vent and all the necessary inputs and connectors are on the rear panel. The subwoofer is well built and thanks to the materials used, we think it should be quite durable and resistant to severe usage. Polypropylene cone is quite durable and resistant to moisture and mold. The aviation-grade carpet on the surface can protect the subwoofer in any situation and keep it safe from damage. The sound quality is quite good, especially if you take the size of the subwoofer in consideration. Road Thunder delivers very powerful bass and amazing performance for such a small subwoofer. It is easy to install in most of cars and thanks to its size, it is perfect for smaller ones. It has a built-in amplifier, so you won’t have to buy an amplifier separately. Besides, it comes with the external bass remote that enables you to control the bass from the driver’s seat. Road Thunder doesn’t provide big output and there is a certain amount of sound distortion at high volumes. Yamaha is one of the companies that make great audio equipment with a great level of quality. The product we are presenting to you confirms the reputation of this company. Yamaha YST-SW012 is a small (11x11x12 inches) and relatively light (18.72 pounds) active subwoofer. It has an 8-inch driver with a magnetic cone, its amplifier output power is 100W and the frequency response spans from 28 Hz to 200 Hz. It uses front-firing bass technology and the enclosure is vented on the side. The subwoofer comes in black color only and it belongs to the group of the more expensive subwoofers on our list of 16 best 8-inch subwoofers. The manufacturer offers a 2-year warranty if you buy the product. The subwoofer comes in a rather simple and maybe even unattractive cardboard box with Yamaha logo on it. In the box, you will find the user manual, some kind of foamy pads with an adhesive that is supposed to be glued to the bottom of the subwoofer, RCA cable and 2-year warranty card. YST-SW012 is nicely designed square-shaped small subwoofer. Thanks to its size, all-black style, and attractive look, this subwoofer can easily fit into any room. On the front side of the subwoofer, you can see the 8-inch driver with a magnetic cone that ensures durability and long-life to your new subwoofer as well as great sound quality. On the right side, there is a vent (hole), which means the subwoofer has vented enclosure and that means better sound quality because more air can be pushed out. On the back side, you can see the power on/off button, LED indicator light, power cable and the RCA input next to the volume control button. The volume can be easily adjusted by sliding the button to the right or to the left side. The subwoofer is nicely built and it seems quite durable and resistant to damages. The wooden enclosure only increases the level of subwoofer’s resistance. The product is self-powered and it has a built-in amplifier, which means that you don’t have to spend any more money on an external amplifier. The subwoofer can be easily connected to your AV receiver and if you have the necessary cables, it will take you less than a minute to connect everything. The sound quality of this subwoofer is amazing considering its size and power. The bass response is more than satisfying and all the tones produced by this subwoofer are accurate, natural and pleasant to the ear of a listener. The subwoofer is perfect for smaller rooms where its sound and performance can make a great difference and show all the potential. 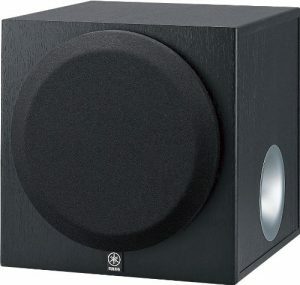 YST-SW012 is less powerful than some other subwoofers of this size and within this price range. It is not so great for cars and it is probably better to use it as part of a home speaker system. Also, it is not powerful enough for larger rooms. The subwoofer doesn’t have the adjustable crossover knob, it doesn’t have speaker input or output ports, which means you have to connect it to your AV receiver and use it as part of your home theater system. In addition, the subwoofer doesn’t feature automatic sleep mode (it won’t turn off automatically after certain period of inactivity) and you will have to turn it off manually. 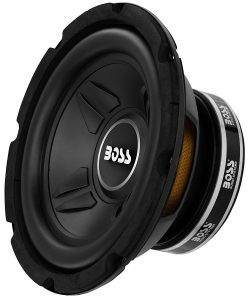 Boss CXX8 (Chaos Exxtreme) is one of the cheapest subwoofers among those 16 models on the list and that has its benefits and downsides. The subwoofer is very small (9x9x4.3 inches) and it weighs only 4.6 Ib. It has an 8-inch driver with polypropylene cone and 2-inch copper voice coil. CXX8 comes in black color only and it is meant for smaller cars. It can reproduce bass down to 49 Hz; its RMS output power is 300 W, the max power 600 W, impedance 4 Ohms while the SPL is approximately 83dB. The subwoofer comes in a nice cardboard box with a user manual and 1 or 2-year warranty card. CXX8 is a quite small subwoofer that can be easily installed in any car in order to increase the general sound quality and add a lot of punchy bass to your favorite music. It is nicely built and it seems quite durable as the polypropylene that’s used for making the cone is supposed to be very resistant to different damages. Besides, the butyl rubber that surrounds the cone is synthetic rubber and it is supposed to be resistant to different weather conditions. The subwoofer can work nicely in both sealed and ported enclosures and the manufacturer sends you the instructions on how the enclosures should look. Sealed enclosures shouldn’t be bigger than 13x8x9 inches while the ported enclosures shouldn’t have bigger dimensions than 15x9x11 inches (the preferable length of the port is 7 inches and the diameter 3.5 inches). The sound quality really depends on the circumstances and the enclosure, but we can say that the subwoofer delivers quite pleasant and natural bass. The subwoofer doesn’t come with an enclosure so you have to buy it separately and install the subwoofer on your own. CXX8, as the manufacturer claims, has to be given some time to break-in and start sounding as it is supposed to sound. It has to be used for 3-4 hours at low to medium volumes in order to break-in. In case you don’t do as instructed, you will be in risk of overheating the subwoofer and it may even get damaged beyond repair (this sounds a bit extreme but that’s what the manufacturer said). 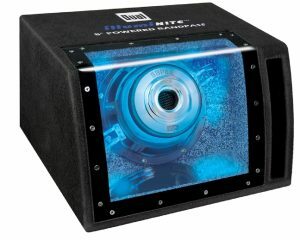 Dual Electronics Illuminite SBP8A is a mid-priced 8-inch subwoofer with the 2-inch voice coil. It is relatively small (15x9x15 inches) and it weighs 21.8 Ib. The subwoofer has the max output power of 160 W while its RMS power is 80 W. The product belongs to the group of active subwoofers with built-in amplifiers, its impedance is 2 Ohms while its frequency response spans from 20 Hz to 200 Hz. It comes in black/grey color combination only. The subwoofer comes in an interesting cardboard box with a user manual that contains all the instructions necessary for understanding how the subwoofer works. The product comes with the 1-year warranty card. Dual Electronics Illuminite has an attractive design and the color it comes in is quite neutral so the subwoofer will blend into any environment as it is mostly made for cars and most of the cars have black/grey interior, at least inside the hatchback. The subwoofer has bandpass design and on the front side, you will see the acrylic window. You can also see the subwoofer through the window as well as the blue background as the surface behind the window turns blue when the subwoofer is turned on thanks to the blue LED light and the installed mirror. On the front side, there is also a vent that enables the subwoofer to push more air and deliver better bass. On the top panel, you can see the company’s logo as well as the product’s name, while the buttons and inputs/outputs are on the rear end. You will see there the variable crossover, phase control, and input level control buttons right at the top. In the middle, there are low and high-level input ports, while the 7.5A ATO fuse protection and the barrier strip power terminals are in the at the bottom. The subwoofer seems well-built and quite durable. The cone is made of durable polypropylene material that guarantees great sound as well as long life. The enclosure is mostly made of carpet with acrylic and plastic parts. The subwoofer has its own amplifier, which means you won’t have to buy an amplifier separately. The sound quality of Dual Electronics Illuminite is good for the price. Nothing mind-blowing really, but it is enough for any small car or smaller SUV. The bass this subwoofer delivers is very nice and it sounds good even at low volumes. It is not too boomy or too loud so you won’t be disturbed while driving. You won’t need too much power to make this small guy perform well. The LED light looks very nice at night. Dual Electronics Illuminite is not very powerful subwoofer and if you’re looking for more power, you should add some money and buy a more powerful subwoofer. The LED light can be distracting and even look weird because it shines all the time and depending on the type of the car, people can see it shining from your trunk/back seat. It would be better if it has some switch that can be used to turn the light on and off according to the user’s preferences. 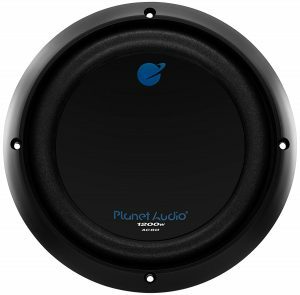 Planet Audio AC8D is an inexpensive small (4x8x8 inches) and light subwoofer with the polypropylene cone. The peak power of the subwoofer is 1200 W while the RMS power is up to 600 W. The impedance is 4 Ohms, sensitivity 85 dB and the frequency response spans from 23 Hz to 3 kHz. The product comes in black color only. The subwoofer comes in a nice and simple cardboard box with a user guide and 3-year warranty card. AC8D is a well-built subwoofer with PP cone that guarantees durability and increases sound quality. The foam around the cone might not seem reliable but we assure you this material has been improved a lot and it is very durable when used for this purpose. The subwoofer is nicely designed and thanks to its size, it can be easily installed in any car (preferably smaller car) in both sealed and vented enclosures. If you choose sealed enclosure, you should get the enclosure no bigger than 18x5x11 inches. In case you want a vented/ported enclosure, its dimensions should be 14x12x14. The power of the subwoofer is completely satisfying considering the price and the size of the product. The setup is also very easy and quick, so you shouldn’t have major problems with that. The sound quality is decent for the price and many customers say the subwoofer can be quite loud and powerful even at low volumes. The sound is pleasant and balanced. If you’re looking for a car subwoofer, this might be the right thing for you. AC8D doesn’t have a built-in amplifier so the low price doesn’t mean you won’t have any additional expenses. The subwoofer doesn’t come with the enclosure so you have to buy one separately and try to decide which type of enclosure you like more (sealed or vented). Pay attention to the manufacturer’s warning. You should spend a few hours breaking-in the subwoofer. In case you don’t do that, you could cause the subwoofer to perform poorly and you could even damage it. Sound Storm Laboratories LOPRO8 is 8-inch small (9x13x3 inches) and relatively light (approximately 12 Ib) car subwoofer. It has RMS power of 300 W while its peak power is 600 W. The subwoofer has a single voice coil, bass boost from 0 to 12 dB, low pass filter from 20 Hz to 150 Hz and the subsonic filter from 20 Hz to 50 Hz. The product comes in black color only and you get a 1-year warranty that you can use in case the product damages or stops working. LOPRO8 comes in a nice cardboard box with a company logo on it. In the box, you will find the subwoofer, remote subwoofer level control, remote subwoofer control cable, mounting legs, and all the necessary screws as well as the high-level input wire. SSL LOPRO8 is well-built subwoofer that has sealed aluminum enclosure that guarantees durability and resistance to different kind of damages. The subwoofer is relatively small and the greatest thing is that it is very short so the manufacturer suggests installing it in small cars under the back seat and mount it to the car with provided screws. This subwoofer is probably one of the rare subwoofers that have so many controls. They are located on the front side of the enclosure next to the power status light. The provided remote control is inserted into the remote level control port and it is used to adjust the volume. There are also input gain control, subsonic and low pass filter controls, bass boost as well as the phase shift. On the top panel, you will see the company logo next to the driver covered with aluminum mesh. On the rear panel, you have power terminals, the main and the spare fuse as well as the low and high-level inputs. The subwoofer fills smaller cars with a good amount of bass without annoying distortion. The subwoofer has a built-in amp, so you won’t have to buy one separately and worry if you have combined them together properly. Be careful about the place where you’re putting/installing your subwoofer. If there is no good airflow, you risk the subwoofer to heat and go into the protection mode in order to prevent overheating. The subwoofer isn’t very loud and the sound quality isn’t perfect. Some customers even claim that the subwoofer doesn’t sound as powerful as it should be according to the specifications. In addition, LOPRO8 isn’t the prettiest subwoofer in the world and we really don’t like the way it looks. There are many affordable subwoofers on the list and on the market that look much more attractive than this one. Kicker Hideaway is the 8-inch car subwoofer that fits smaller cars without problems thanks to its small dimensions (14×9.5×3 inches). It weighs 9.4Ib, its RMS power is 150 W while its frequency response spans from 25 Hz to 120 Hz. The subwoofer comes in black color with 1-year warranty card. 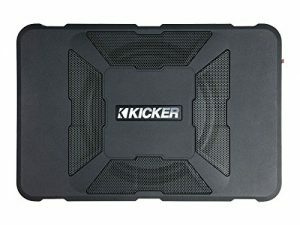 Kicker 11HS8 comes in a simple and thin cardboard box. The product comes well protected and nicely wrapped. Apart from the subwoofer, you will get all the necessary cords (power cord, aux cable), mounting kit (screws, Velcro straps), the instruction manual and the mounting strap hole template. This subwoofer is well built and durable, mostly because of the aluminum sealed enclosure. 11HS8 has a compact size, which makes it adequate for smaller cars. You can put it anywhere – under the seat, in your trunk, on the back seat, etc. On the top panel, you will see only the Kicker logo on the aluminum mesh that covers the 8-inch speaker, while all the controls and the input ports are on the right side of the subwoofer. You will find there the auto amp turn on button, input level button, phase button, LED indicator light, bass boost, frequency control and gain buttons. Next to these buttons, you will find the remote 3,5mm bass input port (where you insert the aux cord), as well as the plug-in port. The installation procedure is very simple and quick, no matter if you choose screws or Velcro straps. The subwoofer has a built-in amp and that justifies its price. The sound quality is decent for a small 8-inch subwoofer and at lower volumes, the bass sounds quite punchy and clear. The great thing is that it comes with the remote bass control button that enables you to adjust the level of bass anytime from your seat. The subwoofer isn’t very attractive and the design could definitely be improved. The price is higher than the price of some similar products. The subwoofer doesn’t have any RCA ports. The package doesn’t include a shielded wire that can be inserted into the low-level input. There is only one wire for the high-level input and this subwoofer sounds better if receiving lower voltage. If you’re looking for the subwoofer that will shake the windows on your car, you better keep reading, as this one is not that loud and powerful. Bazooka BTA8250D is among the most expensive subwoofers on our list of 16 best 8-inch subwoofers. 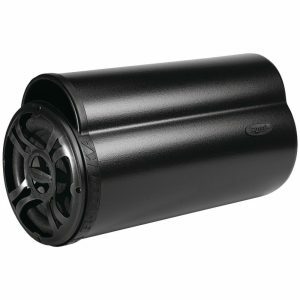 The product comes in black color in the vented enclosure with a built-in 2-channel amplifier (200 W RMS power on 4-Ohm channel and 275 W RMS power on 2-Ohm channel). The frequency response spans from 35 Hz to 250 Hz, max output power is 300 W while the sensitivity goes up to 102dB. The product is relatively small (10×8.5×18.5 inches) and it weighs 3Ibs. The subwoofer comes with 1-year warranty card. The subwoofer comes with a user manual. In case you order the version with the installation kit, you will get a 20-amp fuse holder, power harness, straps and a mounting kit. One of the best things about this subwoofer is its shape and its design. Besides the fact that the subwoofer is attractive and that it comes in matte black that looks really good, the subwoofer has the shape of a tube or a cylinder, which is the natural pressure vessel and it puts out more sound than the subwoofers that are shaped differently. Some amount of sound is usually lost in the corners of enclosures. Bazooka doesn’t have corners and it doesn’t sustain any sound at all. It all comes out of the vented tube and you can enjoy your music completely. In addition, tube-shaped subwoofers are perfect for putting in the corner of your car’s trunk. Being in that position, the subwoofer acts like a natural amplifier and spreads the sound nicely through your entire car. Tube-shaped subwoofers occupy less space in cars and they can be placed not only in trunks but also behind the seats. They save space and increase the quality of music. The installation process is fast and easy. On the front side, you can see the interesting polypropylene protective dust cap with Bazooka logo in the middle. Behind the cap, you can see the driver with protective foam around it. On the sides, you will see only the company’s logo while the input ports are on the backside. There are the ground, optional remote control, high and low-level input ports as well as the RCA port. There is also one 12V fuse and the amplifier status LED light. The subwoofer delivers great sound. In case you want your music to be powerful but not too loud, you should really consider this product. The price is reasonable if you take into consideration the fact that this subwoofer has a built-in amp and you won’t have any additional costs. BTA8250D has the cone made of pressed paper. Considering the price (no matter that this subwoofer comes with the enclosure and the built-in amp), it would be better if some other material was used for making the cone. The sound becomes slightly muddy at high volumes. Bazooka BT8014 BT is a reasonably priced, 8-inch small (8x10x18 inches) subwoofer with a 2-inch single voice coil and peak power of 150 W. The subwoofer doesn’t have built-in amp, it has 4-Ohm impedance (there is also 8-Ohm version), its sensitivity is approximately 102 dB and the frequency response of this product spans from 35 Hz to 250 Hz. The magnet weighs 28 ounces, the product comes in all-black style only and the manufacturer offers a 1-year warranty. The subwoofer comes with the all the necessary wires and with a mounting kit (screws, mounting straps, etc.) for the installation. Bazooka BT8014 BT is nicely designed and very attractive cylindrical 8-inch subwoofer. It comes in black color with a nice elegant finish and the mesh on the front side looks rather interesting and visually appealing. The subwoofer looks simple and minimalistic, and it is also easy to use and install. BT8014 is a well-built device made of strong aluminum materials that guarantee long life and great resistance to any kind of damages. The cone is made from polypropylene that improves the sound quality and can last for a long time. On the front side, you can see the mesh covering and protecting the driver. On the side, there is the Bazooka logo, while the connectors are on the back side and they are used to connect the subwoofer to the amp as the subwoofer is passive and it is not self-powered. The installation process is very easy (once you find the right amp). Thanks to its cylindrical shape, the subwoofer occupies the least space of all the subwoofers and this kind of design can also contribute to the sound quality. Bazooka BT8014 offers decent bass for the price and the size. It is made for smaller cars that have problems with free space as the subwoofer can be installed practically anywhere (under the seat, behind the seat, in the trunk, etc.). The amazing thing is that if you put the subwoofer in the corner of your trunk, it plays the role of a natural amp and boosts the bass spreading it through the car at the same time. Besides, the vent on the top also enables more bass to come from the subwoofer in comparison to the amount of bass delivered by subwoofers with sealed enclosures. The subwoofer doesn’t have a built-in amplifier, which means that you will have to spend some more money and buy the amp separately. Besides, you will have to risk and buy some amp that may not work properly with the subwoofer. However, the manufacturer claims the subwoofer can work nicely with a 4-channel amplifier. BT8014 is not adequate for larger cars as it can’t deliver the sound powerful and loud enough to fill the large vehicles. 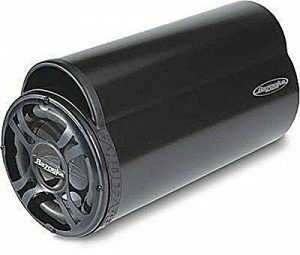 Rockville RVB8.1A is active (self-powered) 8-inch subwoofer made primarily for smaller cars. The subwoofer is quite small (12x13x12 inches) and it weighs approximately 16 Ib. The impedance is 4 Ohms, sensitivity 91 dB while its frequency response spans from 38 Hz to 200 Hz. The subwoofer has a peak power of 300 W while the RMS power is 200 W. The product comes in black color with blue details and it comes at an affordable price. The product comes in a very simple cardboard box with a user manual, remote control box for your dashboard, screws, power cable, remote cable and one high-level input cable. RVB8.1A subwoofer is the 8-inch active subwoofer with a built-in amplifier inside that vented enclosure. The subwoofer has compact design and thanks to its size and angled design, it fits perfectly any trunk or back seat in any smaller car. The product is well built as the cone is made of Kevlar and it is stitched to the rubber material that surrounds it preventing it to fall apart at high volumes because of strong vibrations. The driver is connected to the wooden enclosure covered with durable carpet with a metal circle that comes in blue color and makes the subwoofer more interesting and attractive. On the left side, you will see the blue vent that allows more bass to come out of the subwoofer while the input ports and control buttons are on the right side. You will find there the high-level input port, remote port, RCA input ports as well as the power port. There is also a 20V fuse and gain, bass and XVR control buttons. On the top, there’s a large company logo. 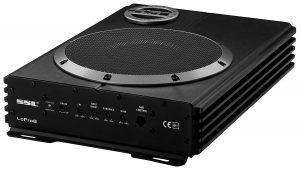 The subwoofer is easy to install as you don’t have to worry about the amp and it has the bass remote that enables you to control the bass volume level from your seat. The subwoofer delivers enough bass for a small and relatively affordable product of this kind. 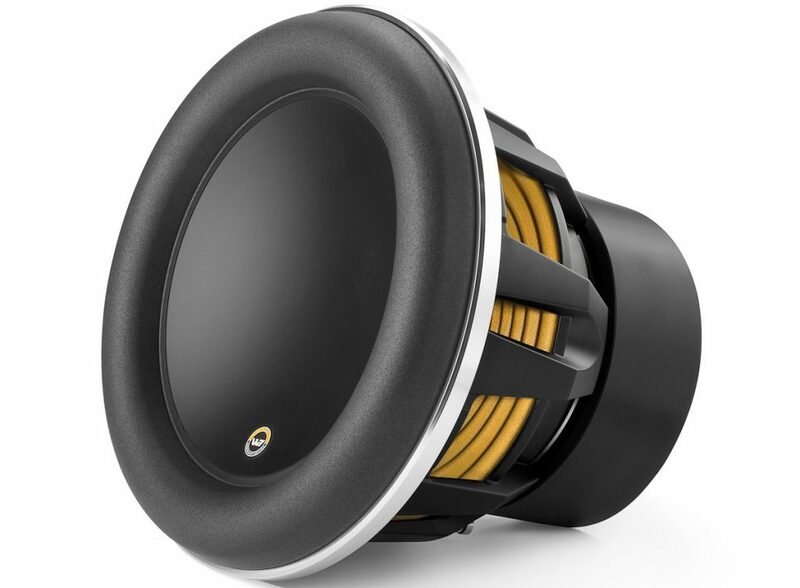 It delivers good and loud enough sound that can fill smaller cars with quality bass. The music gets distorted when the volume is at the max, so we wouldn’t recommend turning it up all the way as it won’t be a pleasant experience for your ears. The user manual that comes with the subwoofer is not detailed enough and some customers had problems with installing the subwoofer. Some also had problems with the bass remote control that didn’t work properly. Pioneer is one of those companies with a long tradition that gained the trust of many people worldwide. It exists since 1938 and it rarely disappoints us. Pioneer TS-SW2002D2 is the 8-inch small (7x7x7 inches) subwoofer that weighs 6.3 Ib. The subwoofer has a max power output of 600 W while its nominal RMS power is 150 W. It has 2-inch single voice coil, its impedance is 2 Ohms, sensitivity is 86 dB while the frequency response spans from 20 Hz to 200 Hz. The subwoofer comes in black color without the enclosure and amplifier and you get a 1-year warranty. The subwoofer comes in a simple package along with a warranty card and user manual. Pioneer TS-SW2002D2 is among the smallest subwoofers on the market. Not only it has an 8-inch driver, it also has the shallow basket. Its depth is barely 3 inches and you must admit that this subwoofer can fit any space. You can use it for smaller cars and save some space or in smaller apartments. The subwoofer is nicely built. It seems quite durable and resistant to severe usage. The cone is made from polypropylene. The subwoofer has cone structure that enables the manufacturer to insert bigger cone without making the subwoofer larger. Besides, it also makes the sound coming from this speaker louder and deeper. The installation process is easy and quick so that any ordinary customer can do it. The sound is pleasant and quite clear as long as you keep the volume at a reasonable level. It is definitely loud enough for smaller cars and smaller apartments. The enclosure and the amp aren’t included in the price. You will have to buy those things separately, which means more time and more money spent. The subwoofer can fit most of the enclosures with the recommended dimensions, but if you want the best results, you should buy the special enclosure Pioneer made for this subwoofer. In addition, this subwoofer can’t really stand high volume. The sound gets distorted, so if you listen to loud music most of the time, you should consider some other product from our list of 16 best 8-inch subwoofers. The subwoofer is not suitable for bigger rooms or larger cars as it is not powerful enough to fill the space with sound. 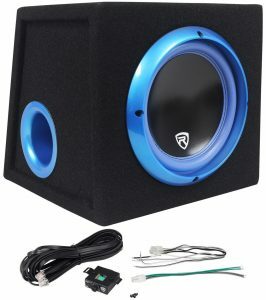 Some customers claim they can say what direction the bass is coming from when using this subwoofer, which means that sound is not equally spread all over the car/room. 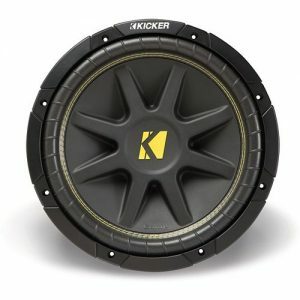 Kicker 10C84 is relatively small (9.4×9.4×5.6 inches) and light (7Ib) 8-inch subwoofer with an affordable price. The subwoofer has 4-Ohm impedance, frequency response spans from 30 Hz to 500 Hz while the sensitivity goes up to 85.6dB. The max output power is 200 W while the RMS power goes from 50W to 100 W. The product comes in black color with 1-year manufacturer’s warranty. The subwoofer comes with a user manual and that’s pretty much all that you get. Kicker 10C84 is one of the smallest subwoofers on the list. It’s made for small cars or smaller rooms and apartments. It is nicely designed and it looks rather attractive and simple but also very durable. It is nicely put together and it really looks like it’s capable of surviving loud and bassy music. On the front side, you can see the yellow company logo. The cone is made from rigid polypropylene and it has 360-degree back bracing. The cone is double-stitched to the polyfoam surround that is ribbed in order to ensure more resistance to damage. The basket is made from steel, it is fully ventilated and it has high-temperature coil wires that prevent overheating or similar damages. The subwoofer can be put in both vented and sealed enclosures and the user manual describes the process of installation for both types of enclosures. It also suggests the best box dimensions for this subwoofer. The installation process itself is very easy and you really don’t have to be an installation expert in order to learn how to install this small guy in your car. Just follow the instructions and it should all be fine. The sound quality is good for such a small subwoofer. If you’re not looking for loud mind-blowing bass, you will be completely satisfied with this subwoofer. It makes your car stereo system significantly better and it occupies less space than some other subwoofers. It can be installed in the trunk, below the seat, in the door, etc. It all depends on your car and your preferences. The subwoofer doesn’t have a built-in amp and it doesn’t come with the enclosure so you’ll have to purchase these things separately in case you don’t already own them. That means additional costs that aren’t included in the price of this subwoofer. 10C84 is not made for big cars or big rooms and houses. The sound is just not that big and powerful. You will notice some distortion at high volumes. The sound is not perfectly clear. 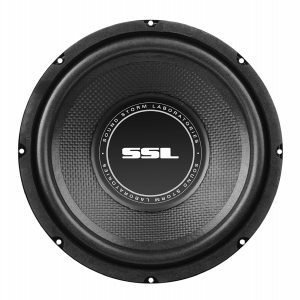 SS8 is a cheap passive 8-inch subwoofer made by the company Sound Storm Laboratories. We have previously reviewed one of their subwoofers and this is the second one. The SS8 subwoofer has 4-Ohm impedance, its peak power goes up to 400 W, while the RMS power is 200 W. The sensitivity is 87 dB and the resonant frequency is 59.2 Hz. The subwoofer is quite small (10x10x4 inches approximately) and quite light. It comes in black color and you get a 1-year warranty. The subwoofer comes with a user manual and nothing else (there is no mounting kit). SS8 is a small subwoofer that is perfect for smaller cars. It has polypropylene cone with a rubber surrounding and the subwoofer generally looks rather durable and resistant to damage. The installation process is easy and the best enclosure for this subwoofer is sealed enclosure without any vents. The recommended dimensions of the enclosure are 12.5 inches (L), 12.5 inches (W) and 12 inches (H). The subwoofer is very cheap and it can deliver bass that’s powerful enough to fill smaller cars with sound. It is not too loud so it is perfect for anyone who wants to add some quality bass to their car stereo system but doesn’t want everyone outside the car to know exactly what they are listening to. Many customers use the sub even at home and they claim it works great as part of a home theater system. Be careful during the first few hours of work. The manufacturer recommends to break it in by playing music at moderate volume. In case you don’t respect the recommendations, you risk damaging your subwoofer. SS8 doesn’t come with any additional equipment. There is no mounting kit just and you won’t get any enclosure. Besides, the sub doesn’t have a built-in amp and you will have to find the perfect amp to pair it with this sub. The product is very cheap, but you have to be aware that you have to spend some more money on mounting kit, enclosure, and amplifier. The subwoofer won’t deliver mind-blowing bass and it won’t shake your car or house. In case you’re looking for something like that, you should buy some larger and more powerful subwoofer. Rockford Fosgate P3SD2-8 is a passive 8-inch subwoofer. It is small (10x10x5 inches) and it weighs 8.8 Ib. The peak power is 300 W while the RMS power goes is 150 W. The subwoofer has dual voice coil, the impedance is 2 Ohms, sensitivity is 82 dB while the frequency response spans from 38 Hz to 250 Hz. The subwoofer comes in black color only and you get a 1-year warranty. The subwoofer comes in a simple black cardboard box with a company logo on it. In the box, you will find the subwoofer, some Rockford Fosgate stickers, user manual and a ring for the subwoofer. 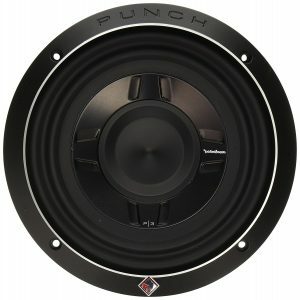 Rockford Fosgate Punch is small and shallow subwoofer that is perfect for small and hard-to-fit cars. The subwoofer looks nice and attractive as well as the ring that is supposed to keep the subwoofer in place. P3 is nicely built and it seems quite durable and resistant to different kinds of damages. The subwoofer has an aluminum cone that ensures extra durability. It also has the dust cap that makes the subwoofer lighter and easier to use. P3 can be used with both sealed and vented enclosures and the user manual thoroughly describes both advantages and disadvantages of both enclosure types so you can decide what characteristics are more important for you to gain. The sound quality is satisfying for the driver’s size. You can’t really expect mind-blowing bass from any 8-inch subwoofer, but this one will be powerful enough to fill your car with pleasant bassy music. Some customers complained that the installation process was longer and more confusing than they have expected. The subwoofer doesn’t come with a mounting kit. There is also no enclosure and you still have to buy an amplifier separately, so we can conclude that the price is too high for such a small passive subwoofer. P3 isn’t very loud, so if you’re looking for something that will be heard outside your car, you shouldn’t be considering this product. The bass is not too heavy and if you want something really strong, you should buy a larger subwoofer (at least 10-inch subwoofer). Skar Audio IX-8 D2 is a small (9.2×9.2×6.4 inches) and light (7.3Ib) 8-inch subwoofer. It comes in black color with a 2-year warranty. Its peak power goes up to 300 W, RMS power is 150 W, its sensitivity is 83 dB, impedance is 2 Ohms (although you can get the 4-Ohm version for almost the same amount of money) and the frequency response spans from 50 Hz to 1000 Hz. The subwoofer has 2-inch copper voice coil. D2 comes in a nice cardboard box with the company logo on it but it doesn’t come with a mounting kit. The subwoofer is nicely designed. It’s black and it looks relatively attractive. On the front side, you can see the company logo and some rubbery surrounding. The subwoofer is made from some kind of metal. Thanks to its size, the subwoofer can be used in cars or home theater systems in case you don’t need extremely powerful bass. It fits nicely into both vented and sealed enclosures and you can find all the performance parameters for each enclosure type on the company’s web page. The subwoofer is meant for smaller cars. It is reasonably loud and it delivers nice pleasant bass that can fill any smaller car with sound. It’s nothing mind-blowing really, but it’s good enough for smaller cars or smaller apartments. You might hear some kind of rattling noise if the sub is given too much power. Some users experienced wires being burnt shortly after the purchase. The subwoofer also needs some time to break-in so you should be really careful about the way you use it. In case you don’t break it in, you could damage it and cause it to perform poorly. If you follow the instructions, everything should be fine. Just do not expect car-shaking bass – this subwoofer is simply too small for that. Besides, the manufacturer used pressed paper to make the cone. This is not the top-quality material for making cones. Compared to aluminum, Kevlar or PP, it’s much worse. There are some better subwoofers that have more durable cones and cost less. The sub comes alone without the enclosure or built-in amp, so you have to worry about finding the right box and the right amplifier for it. You might have thought that the price was affordable, but you should always take these additional costs into consideration when buying passive subs. 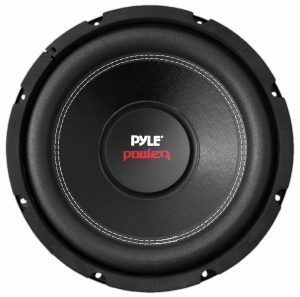 Pyle Power is one of the cheapest subwoofers on the list. It has relatively small dimensions (8.2×3.7 inches) and it is quite light (4.17Ib). Its peak power goes up to 800 W while the RMS power is 400W. The subwoofer has 1.5-inch dual voice coil that can work on both 4-Ohm and 8-Ohm channels. The sensitivity of the subwoofer is 89 dB while the frequency response spans from 40 Hz to 3000 Hz. It is made in black color only and it comes with 1-year warranty. The subwoofer comes in a nice cardboard box with all the necessary cables and a user manual with all the installation instructions. Pyle PLPW8D is small subwoofer that can be easily installed into any smaller car or smaller room. It will save you some space and it will deliver the sound powerful enough for a small trunks/rooms. It can be installed anywhere and you can use sealed or vented enclosure (the dimensions and characteristics are given in the user manual). The subwoofer is nicely built. It is simple but attractive. On the front side, you can see the Pyle Power logo. The cone is double-stitched to the foamy surrounding so that it can handle strong airflow. The basket is made of steel and it looks rather durable. On the back side, you can see the connectors for the necessary wires. As you can see, the design is quite basic. However, that doesn’t cause the subwoofer to perform poorly. 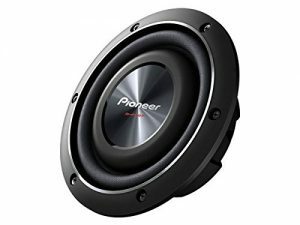 It is quite powerful for a cheap 8-inch subwoofer and it manages to deliver nice, crisp and clear bass that will fill your small car with a sound in a blink of an eye. The subwoofer is very cheap but cheap usually means more additional costs. The speaker doesn’t come with the enclosure. You won’t get an amplifier either. That means you have to think about the type of amp you want to combine with this subwoofer. Besides, amps can be expensive. Pyle Power is not an extremely powerful subwoofer. It is loud enough for smaller cars and smaller apartments/rooms, but nothing more than that. If you want mind-blowing bass that will shake your car, you better keep searching. The most important deal breaker is the cone – it’s made from non-pressed paper. We know that the subwoofer doesn’t cost a fortune but that’s because paper cones are not as durable as some other cone types. Some of the customers complained about some strange rattling sound that the cone was producing. Some also had problems with the subwoofer being blown after only a few months. There are numerous models and kinds of subwoofers on the market and we have presented only one type (one size, to be precise). Finding the right sub is not an easy task and that’s the reason why we’ve decided to write this article. We wanted to warn you about the most important things you have to pay attention to when buying subwoofers, starting from the driver size to the power ratings, materials used for making the specific subwoofer, etc. Driver size is one of the most important characteristics of any subwoofer. People usually claim that the size of the driver affects the bass depth and the response time. Smaller drivers have better response time while larger drivers produce deeper bass. Bass waves are long waves and the driver struggles hard to deliver them loud enough so the human ear could hear them. Basically, there are two ways to produce these tones loud enough for the human ear to hear them. One way is to get the subwoofer with a bigger driver. Small drivers (6 or 8-inch drivers) can’t help a lot as they won’t produce the deepest bass. On the other hand, large drivers are slower so the best option would be to get the subwoofer with 10 or 12-inch driver. Sometimes even larger subwoofers (15 or 18-inch) can help as they produce extremely deep bass. You just have to make sure they have a satisfying response time. The other way to get loud deep tones is to increase the power. From this point of view, we can say that the bigger the wattage the better the bass. However, don’t think that bigger wattage means louder subwoofers because it doesn’t. Sometimes the 1000W subwoofer isn’t louder than a 100W subwoofer. It is well known that human hearing spans from roughly 20 Hz to 20 kHz and most audio devices try to fit into that range. Subwoofers produce low-frequency tones and those refer to the first number in the range. You should know that subwoofers that can produce tones at approximately 20 Hz are amazing subwoofers but they are also very rare and very expensive. Most of the affordable subwoofers can’t really go anywhere near 20 Hz, but you should be aware that every quality subwoofer should be able to deliver at least 35Hz tones. Just like the subwoofers are crucial for well-produced low tones, subwoofer cones are crucial for producing any sound by the subwoofer. The cones move to the back and to the front displacing the air. This process creates sound. As you could assume, the cones are made from different materials and the choice of the material depends on the manufacturer, the predicted price of the subwoofer, etc. The most common materials used for making the cones are paper, aluminum, carbon fiber, polypropylene, and Kevlar. They all have their advantages and disadvantages. It is not just any kind of paper but a specially treated paper. It appears most frequently on the market and it is usually used for cheaper subwoofers. The main advantages of this material are small weight and fast response. However, the paper is not very durable, so the manufacturers add some kind of protective coating that makes it more resistant. These materials are also commonly used for making the subwoofer cones. They are more rigid than paper and that is preferable for any kind of cone, no matter if it is a speaker, amplifier or a subwoofer cone. Carbon fiber is a lightweight, durable and flexible at the same time. It is a great combination of characteristics. When used for making subwoofers, carbon fiber can resist quite high output levels. This material has widespread use in today’s world. Polypropylene is very light but also very rigid material, which makes it a great choice for making cones. The good thing is that this material is resistant to moisture, mold and similar types of damage. When we say Kevlar, we mean metal fibers that are extremely durable. Apart from that, this material is very light, reliable and flexible. It can survive severe usage without being deformed and the proof is the production of bulletproof clothes made from this material that has recently become popular. According to the position of the driver/speaker, subwoofers can be divided into two groups. We have the subwoofers with front-firing speakers and subwoofers with the down-firing speakers. Both types can be equally good and they produce equally amazing sound. Front-firing subwoofers have speakers on the front side or on the left/right side of the enclosure. On the other hand, down-firing subwoofers have their speakers positioned towards the floor or the surface they are standing on. If you live in the apartment on the second floor or higher, we wouldn’t recommend buying a down-firing subwoofer as it can disturb and annoy your neighbors living on the lower floors. What we call enclosure is basically the housing for the driver/speaker. To make it simpler, it is the box where the driver/speaker is placed. It can be usually seen in two different versions (bass reflex and acoustic suspension) and depending on the version, the sound quality and its color will be different. Acoustic suspension enclosures are in fact completely closed boxes with no holes or ports. They don’t let the air to come in or out. The subwoofers with these enclosures deliver more accurate bass but they have one big problem with the power supply – they need more power than others. Bass reflex enclosures are designed in the way that allows more air to exit the box. The air comes out through the hole that’s called port. The released air increases the bass response and makes this kind of subwoofers more power efficient than the previous version. However, these subwoofers can never be as accurate as the acoustic suspension subwoofers. Some subwoofers can also use passive bass radiators to help them produce stronger bass. Crossover is one of the main characteristics of speaker systems. It is actually nothing but an electronic circuit that manages and directs all the frequencies below the specified frequency towards the subwoofer. That basically means that the crossover sends all the frequencies that the main speakers can’t produce to the subwoofer, which produces only those very low frequencies. That refers usually to the frequencies lower than 80 Hz but it can be set up according to your needs and preferences. Low-frequency tones aren’t directional, which means we can never know for sure which direction they are coming from. That also means that when you’re setting up your speaker system, the most important thing isn’t the position of the subwoofer. It is important that the subwoofer is in front of you, but the positions of the main speakers are way more important. However, don’t neglect the subwoofer completely. Some claim that its position can contribute to its loudness and that’s something worth trying. For example, if you put the subwoofer in the corner or closer to some wall, it may be louder than at some other place. Also, pay attention to the size of the subwoofer. It should be complementary to the size of your room/apartment. If the room is small, there is no reason for you to buy bigger or more powerful subwoofer. However, if you have a big room, you should consider buying bigger subwoofer in order to get the necessary sound quality and loudness. 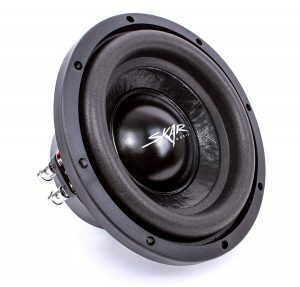 In this article, we have presented to you 16 different models of the best 8-inch subwoofers that we could find on the market. Considering they are small subwoofers, they all have good characteristics and we really hope you will be able to find the model that suits best your needs and lifestyle. NextDo Headphones Increase Your Risk of Hearing Loss?